As each and every dog is different, use whatever suits your dog the best – even try a combination of the various modifications for effect. Never leave a dog that has a fear of fireworks outside alone, or with another dog. This is simply asking for trouble and an increased reaction to a fear that is already in place. It is in situations such as these that dogs often try to escape over walls and fences and may end up hanging or injuring themselves. I you do have a situation where your dog may be alone outside until you get home, then in addition to spraying twice a day, ensure there is a safe place for your dog and spray inside this area as well. Perhaps you can make arrangements with a neighbour, family member or even a per sitter, who can go and stay with your dog until you get there. If at all humanly possible have the dog inside and with somebody with it to lessen the stress. If the fear is really excessive and the dogs tries to bolt, escape, defecates in fear, then we really would suggest that you speak to your vet and in addition to the FOTD Storm Spray, your vet may suggest putting the dog on a vet medication. If you have gone the route of counter conditioning whereby you may play a game of ball with your dog when it reacts to a storm - change this completely and perhaps try putting the dog on lead and walk around the house with it - you can toss a ball for it to catch next to you or similar. You get the general idea? Just change whatever the dog normally does to break the pattern. Although owners are told to ignore their dogs during storms so that the behaviour you do not want is not reinforced, I do feel that this is rather excessive and the terminology ‘ignore’ is often misunderstood by owners. Personally I prefer the wording ‘don’t pander’ to your dog by way of picking up, cuddling, making a fuss of etc. 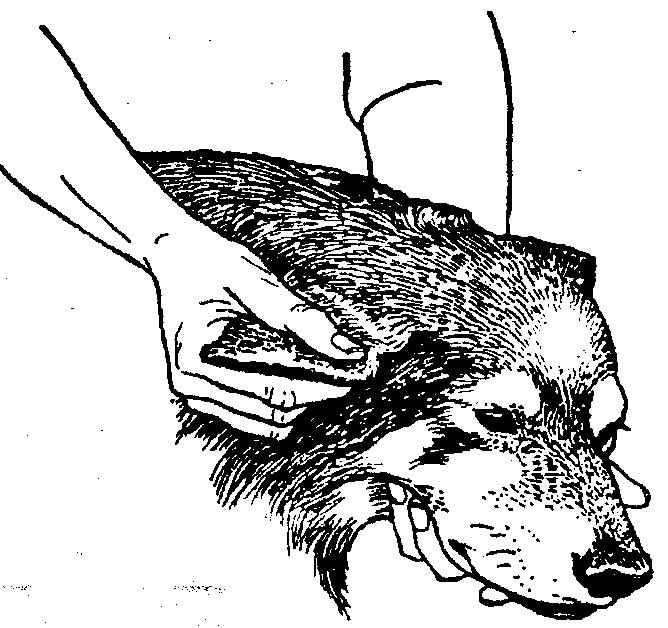 If the dog can cope just being around you then this is fine – however if the dog is insisting on being right next to you and is really not coping, then allow it to be with you and do a bit of very causal Ear Work and some of the Acupressure examples at the bottom. The emphasis here is on being very casual about it – if the dog feels that you are stressing as well, as mentioned above, you will be reinforcing the behaviour you don’t want. As a behaviourist if I tell a client to ignore a particular behavior, simultaneously I tell them to reward any good behavior exhibited and in the case of a dog that was storm phobic, I encourage the owner to praise the dog for any lessening of the behaviour, no matter how slight. If the dog is following your every move, allow it to do this, but also try to sing or laugh to lower your own stress levels. Singing and laughter help us, the owners to relax, and guess what, if we are more relaxed about the dog’s behavior, the dog will pick this up from us and in turn become more relaxed itself. Dogs normally feel more secure when they have an area they can hide away from the storm. This is based on a dog’s natural ‘den’ instinct. Under no circumstances should a dog be forced into a safe place, it must be the dog’s choice. Place a blanket or an old item of clothing of yours in the safe place. Dogs often feel more secure when they can be near our scent. Ideas for safe places – bathroom, in a cupboard, under a bed, behind a chair or curtains, in a crate. Another place that appears to be especially helpful is to place the dog in a car - but bear in mind that the owner should stay with the dog and the car to be in a garage. Use the FOTD Storm Fear Spray in these areas as well. Ensure that your dog has easy access to this safe place at all times and get into the habit of allowing the dog to chew on a nice raw femur bone or its favourite Busy Buddy Squirrel Dude, which it is only allowed in the safe place. This will help to build the dog’s association that the safe place is a rewarding place to be. This will make this area even more appealing to your dog as well as give it something to do during the storm. Chewing can actually lessen the amount of stress that a dog is feeling. Initially, the dog may not want to chew, but as it relaxes this can and often does change. Turn on as many lights as possible so that the secondary lightning will not be as frightening to the dog helps, and also shut the curtains to deaden the noise. The sound of music or a TV is often helpful in assisting a dog to cope with storms, so turn up the volume, and have a great time singing and dancing to the music and play silly buggers with your dog trying to get it to join in. According to the National Institute for Health and Clinical Excellence in the UK, exercise increases brain serotonin functions in humans and it is believed that it has the same effect on dogs. Serotonin is a brain chemical that assists in passing messages to the nervous system and performs many functions including the regulation of mood, and during exercise serotonin levels are increased. Any owner of a storm phobic dog should keep an eye on the weather forecast and if it is likely that there will be storms occurring take the dog for a long walk or engage in a vigorous game with the dog long before the storm approaches. This is one of the most effective ways to help a dog cope. When there are no storms around, the owner gets into a daily pattern of playing with the dog at the approximate time storms normally occur. This could be an inside game of throwing a soft ball up and down a passage, a game of pullies or similar. What we are doing here is to get the dog to engage in an acceptable behavior rather than an unacceptable one and by doing this we are turning the approach of a storm into a pleasurable experience, rather than a fearful one. These particular toys should only be played with during the preparation time and the actual storm so that they increase in value to the dog and helps to start to change its mind about storms - now nice things are happening during storms - their person is playing with them with special toys. Desensitizing is simply getting your dog used to the noises of a storm when there are no storms around by gradually exposing the dog to increased volume of the fear stimuli. This is more successful with Fireworks but is not as effective with storms, as the dog actually starts reacting to the Ions in the air rather than the storm noises. You will read more about Ions below and if you would like to try desensitizing, have a look at how it is done on the Firework Modifications.